It wasn’t so easy to see the new snow on the Pitztal Glacier today since the webcam had a deep layer of snow across the lens with one small hole to gaze the changing conditions. The Stubai Glacier webcam (see above) was more usable and showed off the new snow that fell overnight at a height of 2500m+. The summer hiking season is still in operation on the Stubai Glacier but it is sure that few braved the sub-zero snow today. 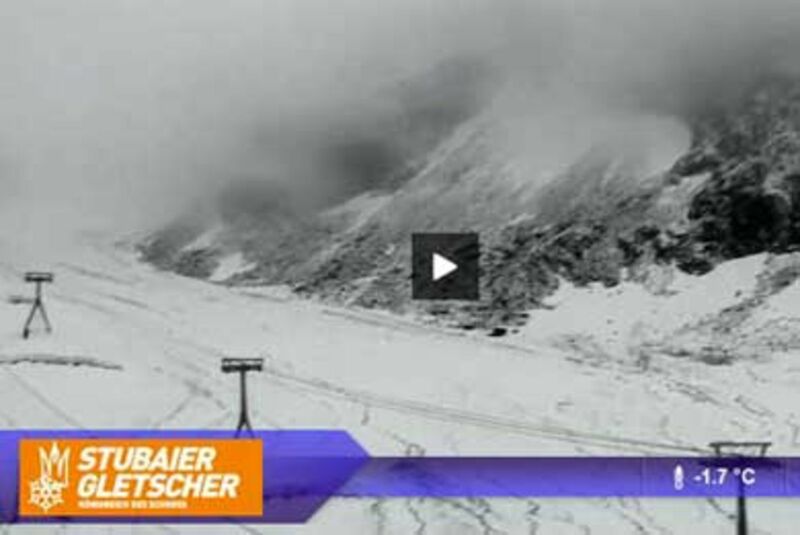 For skiers and snowboarders this was the first significant snow of the summer and bodes well for the development of the Stubai Glacier ski area over the coming weeks, ready for the start of the season which can happen from late September onwards. The Hintertux Glacier is of course open for skiers and snowboarders every day of the year and this fresh snow will make for some really nice conditions under the mighty Olperer. Temperatures are set to rise in the next 2 days before they fall over the weekend and into next week when they will be bringing fresh snow to the glacier skiing areas of Austria. Bring it on!